At Brandtjen & Kluge, LLC. we pride ourselves in customer service. We know that for new and existing customers, as well as most owners of print finishing equipment, it is important to know where consumable products can be purchased long before they are needed. So, with your needs in mind, we have developed a freely accessible Consumable Products Directory for our web site. The online directory currently includes vendor listings in two product categories – Foil Stamping, Embossing & Diecutting and Folder Gluers. Press consumable product manufacturers and suppliers include hot foil, holographic foil, foil stamping and embossing dies as well as steel rule dies. Folder gluer consumable product manufacturers and suppliers consist of hot melt glue, cold glue and applicator tape manufacturers. As a leading manufacturer in the print finishing industry, Kluge has a complete range of finishing equipment distributed across the globe attributing to our tagline, “Print Finishing World”. To follow suit, our Consumable Products Directory consists of both nationwide AND international suppliers of consumables associated with our machinery. Whether you are located in Europe, the Middle East, the United States or elsewhere, you are sure to find a supplier nearby. Visit our Consumable Products Directory and start using this free and valuable resource today. 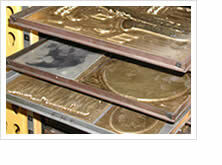 Remember, these resources may be utilized by owners of all brands of print finishing equipment. If you are a vendor and would like to be listed here contact us.